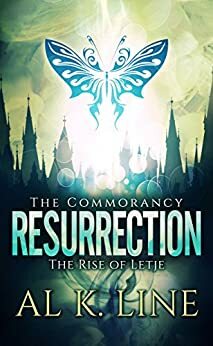 Resurrection encompasses the 5 years ensuing after the death of Marcus and details how Letje, Arcene, Fasolt and Constantine/Yabis return to the Commorancy, now their home, to continue the work that was laid out centuries ago by its founder. Life and Orientations resume until one day Arcene discovers that what was left of the survivors of the Lethargy seem to have disappeared. The group attempts to discover the reason for the inexplicable disappearance of Whole and Awoken and reverse its effects before there is no more reason for the Commorancy to exist. They soon learn that, while very sequestered, the Commorancy is not free from the influence of outside sources. Letje is certain that in order to save her home, she will require help on a level that seems impossible. Letje needs Marcus now more than ever, but how can she speak to him in the Void? Resurrection is definitely not a book that you want to read out of sequence with the prior three novels (Orientation, Contamination, Evacuation). For that matter, it is best to read this story in the order presented. The story line builds on itself in such a way that if you try to read this book stand alone, you will be lost. Also, in certain sections, the story gets so bizarre that I had to stop and remind myself that this is a fantasy. I’m not saying that the story was bad… far from it, but if you look at it from a literal standpoint, not only will you be confused, you will probably just give up. Bizarreness aside, I really loved the way the story jumped timelines so we didn’t see the 5-year timespan sequentially but in snippets relevant to the telling of the story. To watch Arcene progress from a scared almost feral girl to a very intelligent yet still wild pre-teen/teenager was very entertaining. For those of you familiar with the Dragonlance Realm by Margaret Weiss and Tracy Hickman, Arcene struck me as on the same level as Tasselhof Burrfoot; irrepressible, a bit maddening but always entertaining! Also, having read the Arcene novels prior to the Commorancy series, I was especially amused at some of the comments since I knew what was to come. There is more to her story to be explored and I see her as a very strong ongoing character. The further we get into this series, the more I like it. This is definitely turning into something that I can see rereading or letting my son read in a few more years.